, we’re bringing to you “Better Know an Intern!” The series will introduce you to our interns across the globe, and will get you the scoop on the impactful projects they work on, their interests and passions, and what it’s really like to intern at Google straight from the source. 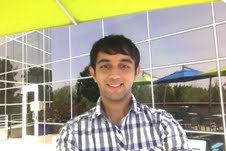 For our second post, meet Aayush Upadhyay, an Associate Product Manager (APM) intern in Mountain View, CA. Aayush enjoys “slacklining” (walking across a line of rope tied between 2 trees) with his other intern friends in his spare time. Upon his return to Yale University, this rising senior wants to continue hosting hackathons and participating in intramural sports. Aayush has also volunteered as a counselor at a local university summer program that brings neighborhood children together through learning and fun activities.